William Cofield Cheesemakers, 6780 McKinley St., Ste. 110, Sebastopol. 707.755.0130. wmcofieldcheese.com. 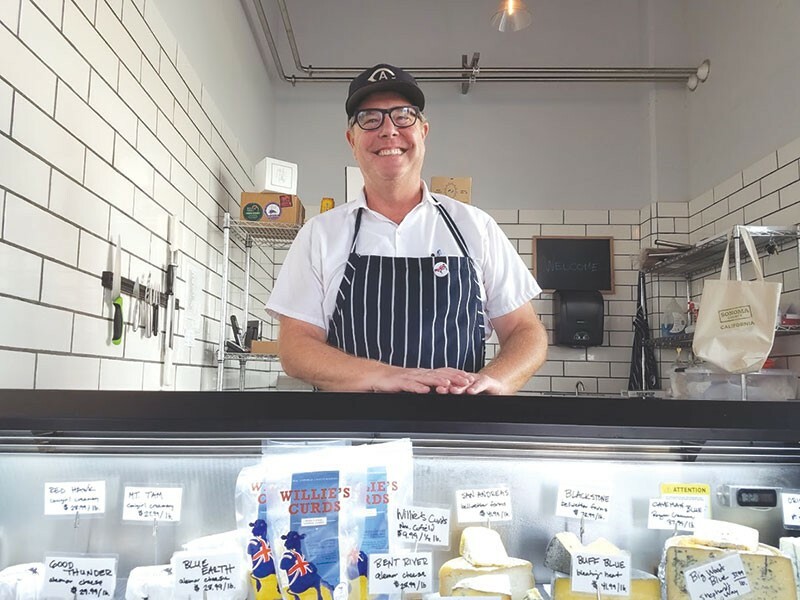 CHEESE TO MEET YOU Keith Adams began his cheese career in Minnesota, but came home to California to pursue his love of British-style cheese. In case you hadn't noticed, the North Bay's cheese scene is dominated by women. There's Jennifer Bice of Redwood Hill Creamery, Sue Conley and Peggy Smith of Cowgirl Creamy, Cindy Callahan of Bellwether Farms, Lisa Gottreich of Bohemian Creamery and Seana Doughty of Bleating Heart, to name a few. But here come the dudes! Old friends Keith Adams and Rob Hunter teamed up to open William Cofield Cheesemakers in Sebastopol last year. There's something else that distinguishes the duo, besides their gender: the cheese. "We're British-inspired cheesemakers," Adams says. "No one is doing anything like this here." Adams already had a successful career as a cheesemaker for Alemar, a Minnesota-based creamery that makes an acclaimed Camembert–style cheese called Bent River, as well as Brie-style and washed-rind cheeses. Adams became intrigued with British-style cheeses (think Stilton and cheddar), having been first exposed them as a boy living briefly in England. He decided to move back to his native California to start a new business and approached his old college friend Rob Hunter about a partnership. Hunter is a winemaker for Hunter III and also works as a wine-industry consultant. The creamery and storefront are located in a small, tidy white-tiled space in Sebastopol's Barlow retail zone. All the creamery's milk comes from Robert Camozzi's Willow Creek Jerseys, an organic dairy on Bloomfield Road southwest of Sebastopol. The milk is organic and the cows are pastured-raised. "If you do that, you're likely to get great milk," Adams says. And great milk makes great cheese. Adams make three cheeses: a Stilton-style blue cheese called Bodega Blue and a cloth-wrapped cheddar called McKinley (named after the street in the Barlow where the creamery stands) and cheese curds, an ode to Adams' years in Minnesota, where the salty cheese squiggles are a beloved state-fair snack. Adams says making the Stilton-style has been a challenge, but believes he's finally gotten it right. "This is the first version that has passed muster," he says, handing me a taste. It's creamy and pleasingly salty, with the great funky tang that Stilton is known for. McKinley is a hearty cheddar that's sharp but tempered with mouth-filling creaminess. I'd like this one paired with some tart apple slices. In addition to their own cheese, the shop sells Alemar cheese and local curds from Bleating Heart, Bellwether, Point Reyes Farmstead Creamery, Cypress Groves, Cowgirl and others. William Cofield Cheesemakers will hold a party Oct. 27 at the Barlow that will feature cheese (of course), live music, a roasted whole hog and the Zazu restaurant food truck. Tickets are $75. "We know how to throw a good party," Adams says.